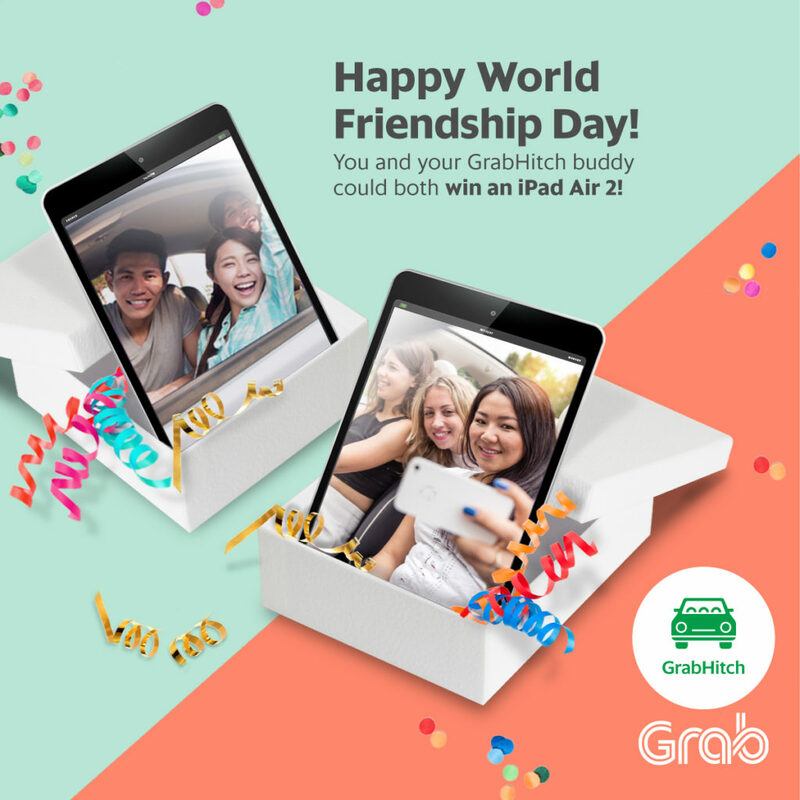 Celebrating World Friendship Day with GrabHitch! Contribute to a car-lite Singapore….. CHECK. Make new friends while standing a chance to win an iPad Air 2….. WAIT, WHAT? That’s right! This World Friendship Day, we’re injecting the social element into your ride-sharing journeys while you and your passenger stand a chance to win some goodies. All you need to do is to take a wefie with your passenger in the car, indicate ONE common interest between the two of you and upload the photo onto your Facebook and/or Instagram*. The social media posts with the highest number of combined likes will be chosen as the winner of the competition and BOTH the driver and the passenger in the wefie will win 1 iPad Air 2 (16GB) WIFI (worth $568.00)** each! So what are you waiting for? Grab the wheel, give a hitch and make some friends with benefits (literally, ha)! *Contest runs berween 30th July 2016 (Saturday) till 7th August 2016 (Sunday) and valid GrabHitch ride must have been made during this period by both driver and passenger. *All posts must be made public for us to see. *All posts must contain the 2 hashtags #grabhitch #grabbff, tag @Grab for Facebook or @grab_sg for Instagram to qualify. **Driver and passenger will each receive 1 iPad Air 2 (16GB) WIFI (worth $568.00). **Driver or Passenger can appear in more than one submission with other people, but the same driver/passenger pair will only be considered once. **If there are more than 2 people in the picture, only the pair with the valid booking will be eligible. **In the event of a tie, Grab maintains the right to select winning submission.